I'm currently and unexpectedly without much internet access. However, normal service should be resumed at the weekend! Here's a battered but originally rather fine piece of street furniture which I noticed on Commercial Road, E1. Initially I thought it was a stink pipe, but the bars at the top and the holes in the post suggest it might have been a gas lamp post. If anyone is certain of the answer I'd be very grateful to find out! Why do a pair of horizontal bars suggest a gas lamp? Well, since the lamps required lighting every evening, someone had to climb up to do it. Obviously, a narrow cylinder isn't the most stable of ladder supports so the bars at the top provided a safe anchor point over which to hook the ladder. The detail around the bottom isn't very sharp, thanks to repainting. 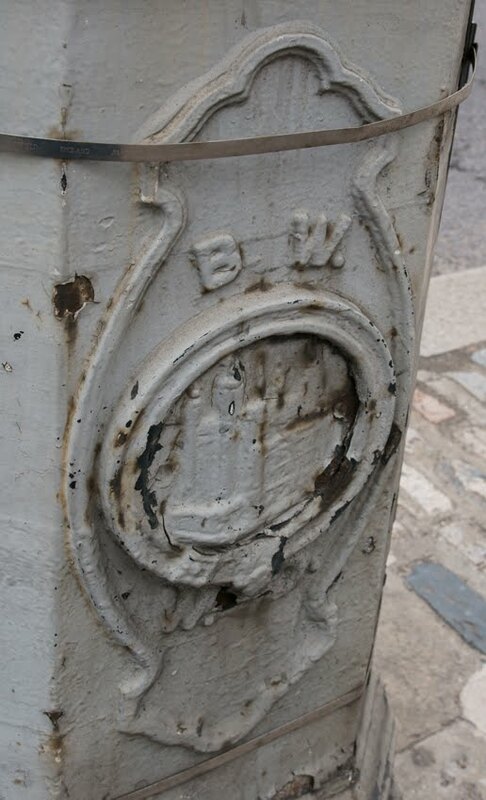 However, there's an image of a building which could be the Tower of London and the letters 'BW'. Today is the second annual Ada Lovelace Day, celebrating women in technology. (Last year's post on Hertha Marks Ayrton is here.) Ada Lovelace, effectively the world's first computer programmer, worked with Charles Babbage. She had been introduced to him by another important woman mathematician, Mary Fairfax Somerville. What do they all have in common? Find out on M@'s new map over at Londonist! 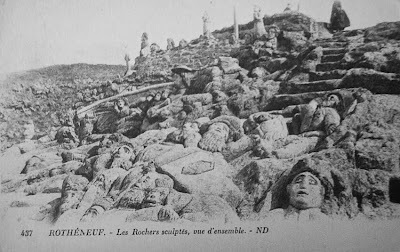 When I posted on the extraordinary rock carvings at Rotheneuf, I mentioned that they are being eroded by the elements. A little while ago, I came across this old postcard. 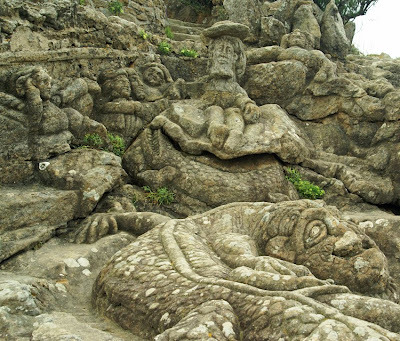 It's undated, and I even wonder whether it's from before 1910 as the area to the right of the steps appears uncarved where today there are more sculptures. Whatever its date, it has brought home the wear and tear caused by the tides. Although the central part of the postcard has survived pretty well - as you can see below - many of the foreground figures are formless or lost and don't even feature in my pictures. Yesterday evening was the Ghostsigns Archive launch event. As well as offering a preview of the archive, it was an opportunity to meet its founder Sam Roberts; catch up with fellow bloggers including Jane's London, Tom of Tired of London, Sebastien of Painted signs & mosaics and Yelphy of Faded London; and get a set of the lovely postcards designed by Sam and Jane. 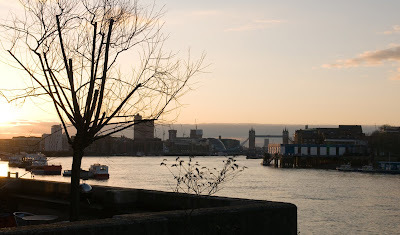 Walking west from Rotherhithe to Tower Bridge. 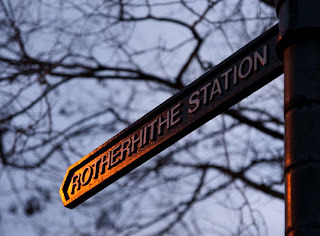 In our haste to climb down into the Thames Tunnel, I suspect that many of Rotherhithe's visitors last weekend didn't pay a lot of attention to the features above-ground. 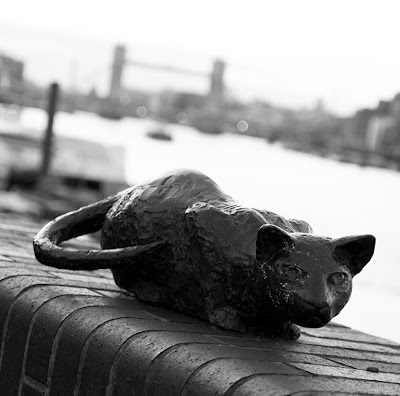 However, the small area of Rotherhithe Village is dense with history; here are a few highlights. An area with a rich maritime past, it has strong Scandinavian connections. 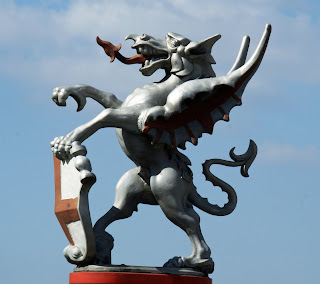 Nowhere are these more visible than on the windvane of St Olav's, the Norwegian church. The most famous maritime link is with the Mayflower. This ship, taking the first British settlers to North America in 1620, set sail from here to Southampton. There, both supplies and pilgrim fathers were taken on board. The connection is best marked by the pub of the same name; although it's on the site from which the ship departed, the current building 'only' dates from the eighteenth century. Across the road from the pub is St Mary's Rotherhithe. 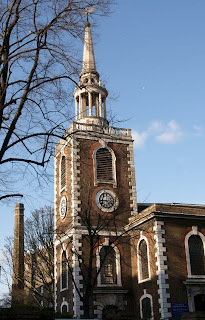 This church was built in the eighteenth century by John James, an associate of Sir Christopher Wren. Perhaps the most interesting burial in the churchyard is that of Prince Lee Boo, who came to London from the Palau Islands in the Pacific. 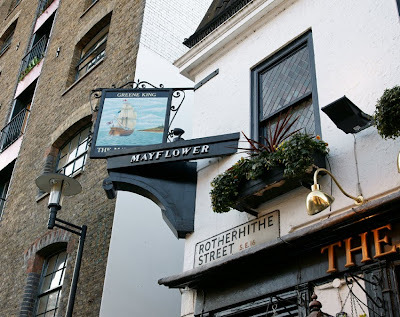 Rotherhithe man Captain Wilson was shipwrecked on the islands, and quickly established friendly relations with the local people. Wilson and his crew built a new ship on the island and, impressed by what he had seen, the chief sent his younger son Lee Boo back to England with them. Although he began his English education in a local school, within a few months he contracted smallpox. Lee Boo was living with the Wilson family and attended St Mary's with them; when he fell ill they called in one of London's best doctors. However, Lee Boo could not be saved and was buried in the Wilsons' family tomb. Facing the church is a charity school built in 1703. 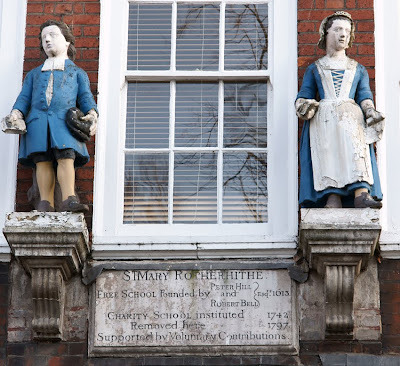 Although the teachers and pupils have long gone, two figures still stand on the facade, proudly modelling their uniforms. Leaning up against the school building is the former watch house. This tiny building was the base for the town's beadle, constable and 14 watchmen; there were even cells in the basement. 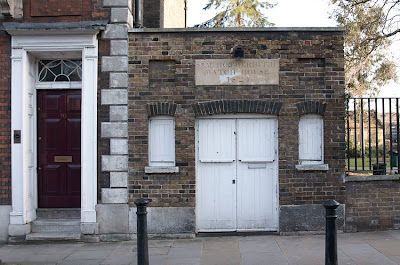 When the Metropolitan Police were formed in 1829, just 8 years after this watch house was built, it was closed. If you want to idle away a few weekend minutes, try tubewhacking! 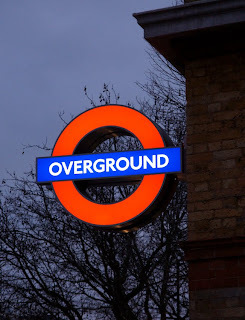 About a million quizzes have asked us which tube station name doesn't contain any of the letters in 'mackerel', and the latest variant is 'badger',* but now you can quickly and easily test any word or phrase. Sticking to yesterday's theme, the only station without any of the letters in 'Thames tunnel' is Woodford. 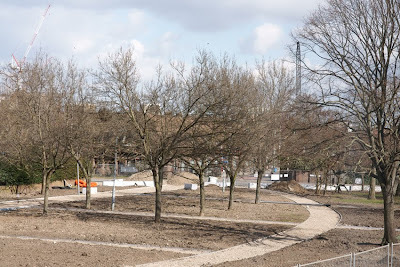 The work on Margaret McMillan Park has moved past the 'making big piles of mud' stage, and the 'new' park is taking shape. There are only four days to go before the launch of the Ghost Signs archive. While we're waiting, the blog has plenty of videos to whet our appetites. *St John's Wood and Pimlico respectively. 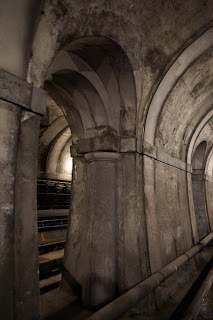 I've written about the Thames Tunnel before, but couldn't resist updating the post after walking through on a guided tour this weekend. It was a unique opportunity to explore on foot, thanks to the hiatus between its use as part of the East London Line and its reopening and rebranding within (ironically) London Overground. 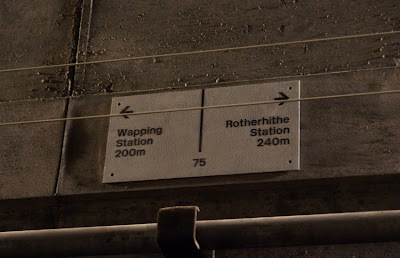 It's far from the first change of use for the Thames Tunnel, which runs between Wapping and Rotherhithe. It was never used for its original purpose: when Isambard Kingdom Brunel’s father Marc proposed the tunnel it was to be a convenient way of transporting cargo across the Thames. In the nineteenth century, the Port of London was at its height and ships had to queue for berths. 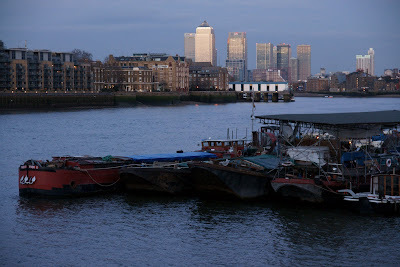 As well as the problem of delays, there was another difficulty: if the ship moored south of the river and its cargo was destined for the north bank, or vice versa, it all had to be transported slowly overground along the riverside, across hectic London Bridge and back down the opposite bank. The suggested solution: a tunnel allowing horses and carts to quickly pass from one side of the river to the other. Brunel’s tunnel was an engineering marvel, the first to be built under a navigable river. Brick shafts were built above ground and sank into place under their own weight (although the first required a little help from a very big pile of bricks; Brunel learned from this and tapered the second so it sank all the way unassisted.) The tunnel then extended between the shafts and under the Thames. 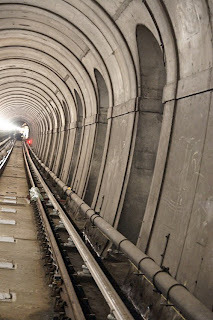 It required the invention of a new tunnelling technique, the tunnel shield, which provides support as each new section is built. (Previous tunnels tended to be ‘cut and cover’, where a big trench was dug and then roofed over – the unsuitability of this for tunnelling under a river is obvious!). Even with such revolutionary techniques, the tunnel took 18 years to build and was only completed in 1843. However, as is often the way with such grandiose projects (think Millennium Dome), things went rather wrong. Money ran out, and although there were stairs down to the tunnel, the ramps for horses were never built. Instead the tunnel became a pedestrian attraction. There were under-river banquets, a shopping arcade, and even fairs. Stallholders stood in the archways dividing the two halves (today, the two rail lines). Souvenirs were sold, some of which can be seen at the fascinating Brunel Museum by the tunnel’s Rotherhithe entrance. However, over time it came to attract dodgy characters and declined in popularity. Eventually, in 1869, the tunnel became part of the new East London Railway and was closed to pedestrians. 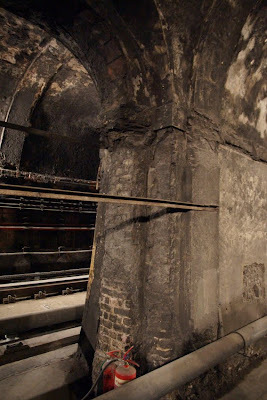 It would only be reopened this weekend, after over 140 years, and the excitement Londoners felt at the opportunity to walk under the Thames can't have been too dissimilar to that of the Victorians. 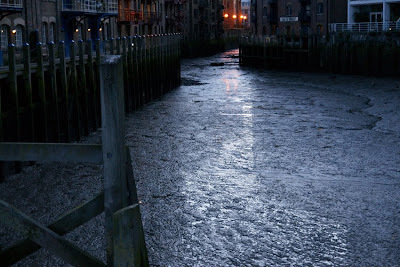 Other bloggers who made the same walk include IanVisits, 853, the Great Wen and Diamond Geezer. *Thank you to Deptford Dame for this information in her comment on my original post. 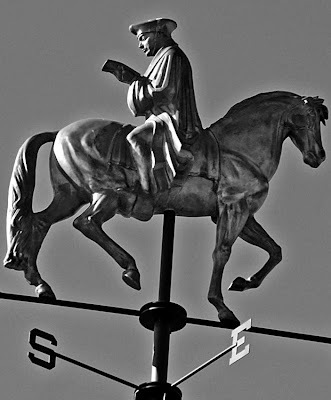 The recently-reopened Whitechapel Art Gallery is now topped by a fine weathervane depicting Erasmus on horseback. It's sat on the extension to the gallery, the former Passmore Edwards Library - whose original plans had included a weathervane, never actually added. 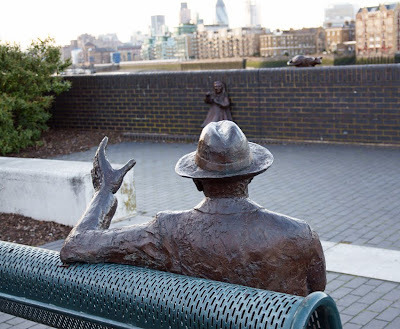 The new feature was sculpted by a Canadian artist, Rodney Graham; its mounted figure is a self-portrait dressed as Erasmus. This was inspired by the story that Erasmus wrote The Praise of Folly while riding on horseback from Italy to England. (Alternatively, and more probably, it was written at Sir Thomas More's estate.) While the reading theme may appear apt for a former library, apparently it's actually a phonebook. Another 'where am I?' 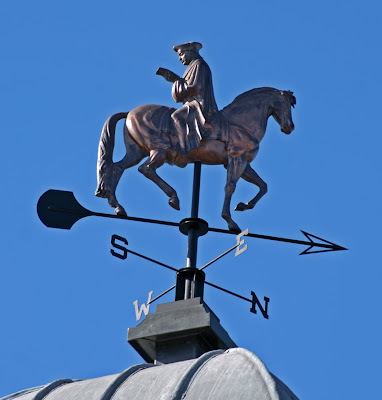 So, where can you see this rather unusual windvane? How realistic is that charming cross-channel ferry on the ceramic map at Victoria Station? A vintage poscard of the ferry Dinard, which sailed the route from Southampton to St Malo in Brittany, shows that it really was very similar to the map illustration. 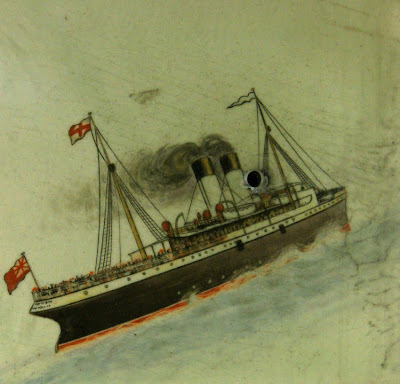 In fact, the steamer on the postcard was effectively owned by the same company as the steamer chugging down the map. 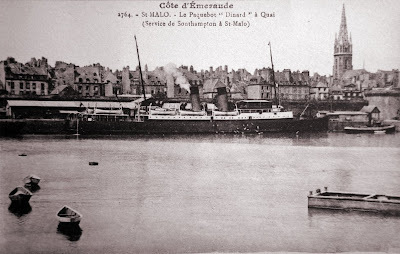 Dinard came into service in 1924, a year after the Southern Railway had been formed by the merger of several companies including the London, Brighton and South Coast whose map featured our first steamer. It was built by William Denny & Bros of Dunbarton for the Southern Railway Company and could carry 1500 passengers. The ferry crossings went on until 1960, interrupted only by World War II when it became a hospital ship and participated in the Dunkirk evacuations. In 1946, it was converted to a car ferry with a capacity of 900 passengers and 80 cars, the latter loaded and unloaded by crane. Finally, it was sold to a Finnish company before being withdrawn from service altogether in 1970. 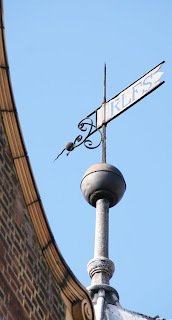 More evidence that it's always worth looking up in London: this parish marker is above the otherwise uninspiring Costcutter opposite Aldgate station. It marks the border of St Botolph Aldgate; looking through lists of London parishes, I haven't managed to work out 'L&M' but suspect I'm missing something obvious! As the name (meaning 'old gate') suggests, Aldgate is on the boundary of the City of London and indeed was the site of one of its city gates. Today, the gate is long gone but a City dragon protects his domain. 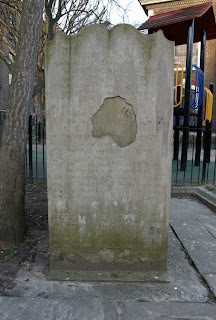 I was in Aldgate in the hope of seeing another boundary marker, though: one of Ronzo's 'Pity of London' sculptures. These alternatives to the dragon are topped by Crunchy the Credit Crunch Monster and have been erected by the artist to celebrate the end of the credit crunch. Sadly, Aldgate's Crunchy was gone by Sunday morning - taken either by collectors or by offended City of London officials - but the film below records its time welcoming those passing between the City and the east end. 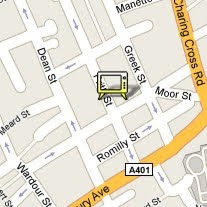 Ronzo's Pity of London - Part 2 from Ronzo on Vimeo. 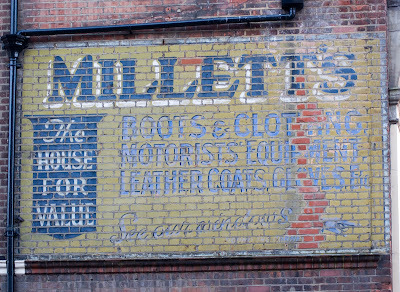 Here are two new ghost signs, one from Croydon and the other, on the Walworth Road, very ghostly indeed! Definitely ghostly is Banks', a shop on the Walworth Road just before it turns into Camberwell Road. Today it's a beauty store, but back when it was Banks' it clearly sold 'fancy goods' and other items which are harder to decipher. Update: Aztec West has worked out the wording. 'Banks Ltd, high class rugs and fancy goods'. Finally, this is a good point to mention that the Ghostsigns Archive opens very soon, on 19 March. 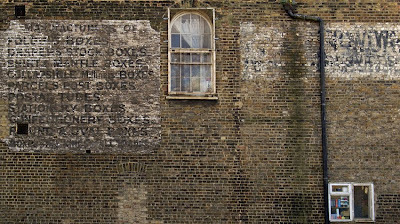 Thanks to Sam Roberts' hard work, it will have over 600 ghost signs from the UK and Ireland (including some featured on this blog), and the sponsors are - very appropriately - Hovis. Find out more about it here. Staying on the Old Kent Road for another day, let's take a look at the Royal London Buildings. 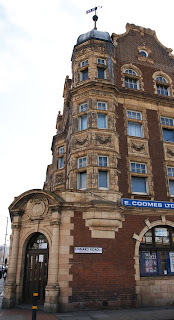 Despite the grand name, it's easy to miss: today the occupiers are E Coombes, bookmakers. 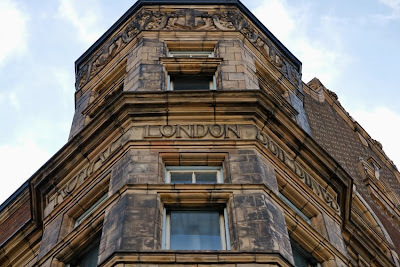 However, above the ground floor original details proclaim the original identity. The name of the building is carved into the facade, but what does it refer to? 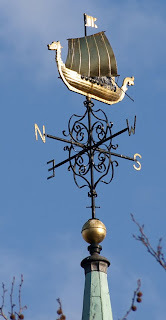 The clue is on the windvane, which bears the initials RLFS; there's also a monogram with the same initials above the front door. These stand for the Royal London Friendly Society. The Society had been founded, like all the best financial institutions, in a London coffee shop. 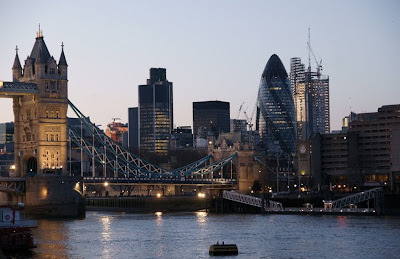 Henry Ridge and Joseph Degge established it in 1861; Charles Dickens Jr's Dictionary of London (1879) lists the society's full title as the Royal London Friendly Society for Granting Policies of Insurance to the Working Classes. (I wonder why they didn't carve the whole of that snappy title on the building?) Subscription was by weekly payment, and money was payable on the death of a member, their wife or children. The friendly society became a mutual in 1908. 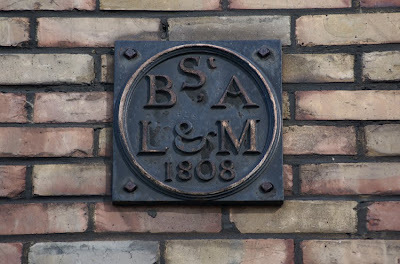 They may no longer occupy their former premises in the Old Kent Road, but Royal London continues to provide life insurance today. In fact, it's one of the largest such companies in the country - and remains a mutual. 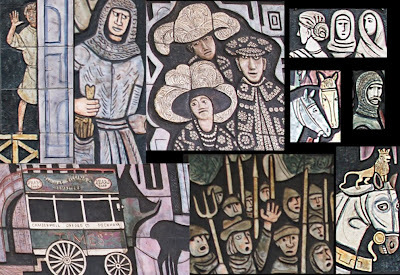 This mural on the former North Peckham Civic Centre is - of course- located on the Old Kent Road, It depicts the history of the street from its beginning as the Roman Watling Street until the near-present. The artist was Adam Kossowski, a Pole who came to Britain as a refugee in 1942. He is more usually associated with religious imagery, and this is his largest secular work. It was completed in the mid-1960s, and survives in excellent condition although the Civic Centre itself has now become a church building. 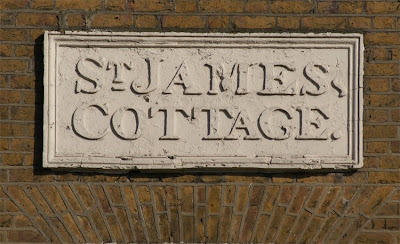 Yesterday I focussed on the lovely sign for St James's Cottage. Today, here's the cottage in all its glory, along with some neighbours. The whole terrace is listed as a group; the Cottage is the earliest building (1827), its neighbours having joined it between 1828 and 1830. They were then known as St James's Place. This area had begun to see development in the eighteenth century, when the road's condition was improved under the management of the New Cross Turnpike Trust. That made it an easy commute into central London, although the area remained primarily one of market gardens. In the 1820s, though, demand for housing in the capital made land more profitable when used for construction and the rate of development increased. St James's Place is one of the results. Across the road are the lovely Carlton Cottages, from the same period. Built in 1829, the curving details on their facades are eye-catching but what makes them particularly distinctive are the ammonite capitals topping their pilasters. 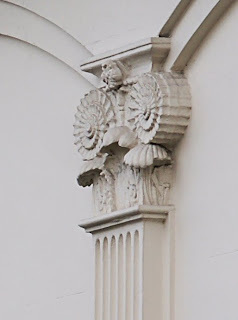 This design had been created by George Dance in London in 1789, and became popular in Brighton at the beginning of the nineteenth century when local architects Amon Wilds and his son Amon Henry Wilds used it in several buildings. Presumably the reference to their own name appealed, and the fact that one of the first occupants of those Brighton houses was a geologist made it particularly apt. 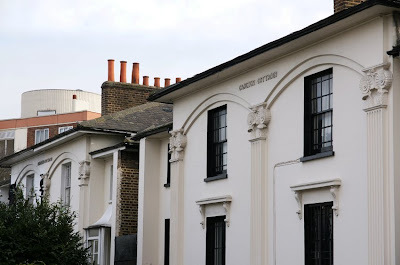 There is some speculation that Carlton Cottages may be the work of those same Brighton architects; certainly, in the late 1820s Amon Henry Wilds' practice extended far beyond Brighton. I love this sign on the New Cross Road, not just because the house it's on is grander than a cottage* but also for the sheer variety of punctuation marks. *It's no longer a rural location either, but New Cross was much greener in 1827 when the house was built. 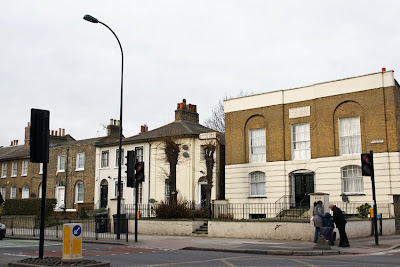 Deborah Wybrow of Crossfield Lane (now Crossfield Street), Deptford was an elderly lady who in June 1834 was still 'in the perfect enjoyment of all her faculties' and supporting herself by knitting. What distinguished her from other old women in the town was her very great age: 102 years old. 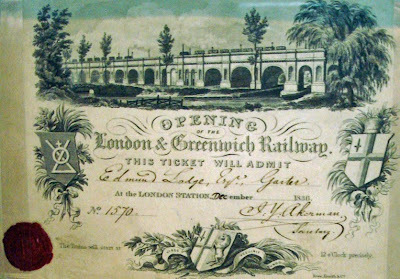 In fact, her longevity brought her the honour of being chosen as the first passenger for the new railway in 1835. Sadly, Deborah would never get her train ride. In April of that year, she fell downstairs and dislocated her neck with fatal results. The newspaper report of her death described it as 'an untimely end'.